Deborah Gilmore, APRN along with Hannah Webster, APRN enhance the practice of Dr. John Chaney, Dr. Angel Nunez, Dr. Walter Rustmann and Dr. Luke Yuhico. This team approach allows for increased access to appointments and quality of care in our Pulmonology Department. Dr. Chris J. Chaney, M.D. 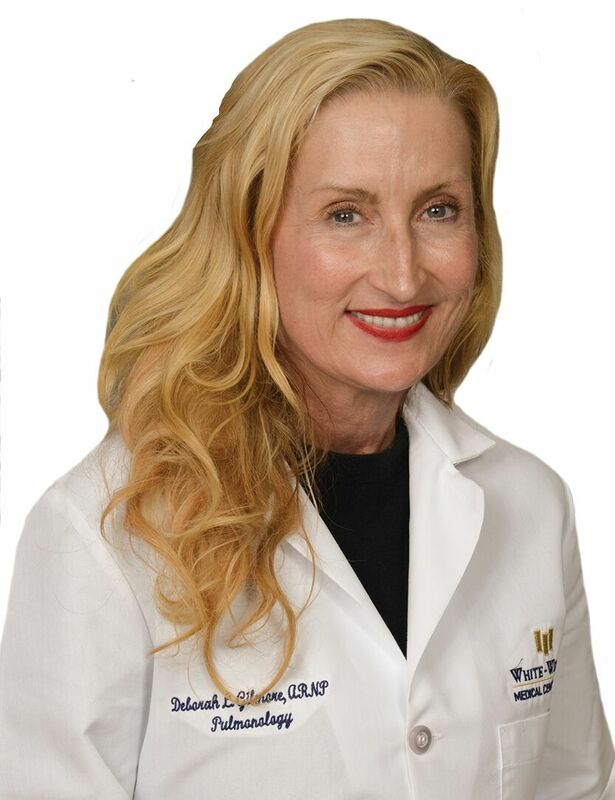 Deborah Gilmore, APRN, is a registered nurse practitioner and has been part of White-Wilson Medical Center's Pulmonology and Sleep Medicine team since 2014. Ms. Gilmore traveled to Guatemala on a medical mission trip where she realized she wanted to become a nurse practitioner to provide additional help to people. Ms. Gilmore practiced as a registered nurse since 1980, before becoming a nurse practitioner. After traveling around the world, Ms. Gilmore went on to receive her Bachelors in Nursing and Masters in Nursing from the University of South Alabama in Mobile, Alabama. Today, Ms. Gilmore is part of one of the most skilled pulmonary departments in the nation, and works alongside Pulmonologists Dr. John Chaney, Dr. Walter Rustmann and Dr. Luke Yuhico to provide chest medicine and respirator medicine to her patients. During her free time, Ms. Gilmore enjoys time with the love of her life and best friend, her husband Steve. She also loves spending time with her two children, her Scottish terrier, Mac, and her cat, Sagwa.